Good morning, fine people! It’s 6am by my watch and we’ve got a WHOLE ‘NOTHER DAY OF READING IN FRONT OF US! ISN’T IT EXCITING?? I’m super pumped (especially since Sunday is usually the day I actually get to read things). It’s a much more chill day, as readers either buckle down to try to hit 24 hours or realize they’ll probably fall short and decide to just read for the sake of reading. Whichever you are, just know that I’m super proud of you and there is no failure in spending the whole weekend reading. So keep going, turn those pages, and keep cheering each other on. For this hour’s challenge, you’re going to help me with a little bit of activism. Take a picture of your very best rainbow book stack, and comment below with a link to your photo. For every photo, I will personally donate $1 to the Human Rights Campaign, in support of its mission of advocating for LGBTQ equality. I’ll pick a winner for this challenge at Hour 36! Now show me your best rainbows! Back to bed I go, until the next challenge is announced at Hour 30. Listen, I’M not punchy, YOU’RE PUNCHY. No, but really, how’s everyone doing? It’s the halfway mark on this ‘thon, and you guys have been reading like whoa. I’m so super impressed with the number of books you’ve been putting away. I’m trying to keep up, but there’s legit so many of you, but only one of me (I swear, it’s just one person back here). How about some prizes to make up for it? If you’re still up (or you’re on the other side of the world), let me know how it’s going for you? What’s the best book you’ve read so far? The worst? Any that you’re still looking forward to? Have you slept at all? And most importantly, what’s the best snack/food you’ve had? I don’t know about you guys, but its cold, snowy, windy, and generally miserable outside. Which, for me, makes perfect reading weather. I’ve got my fuzzy slippers, cozy blanket, and fluffy reading partners plus a whole stack of books to keep me company. What’s the weather like where you are? Are you enjoying the sun or is the winter keeping you inside too? We’re closing in the halfway point. You can do it! We’re close to halfway on the official clock and I’ve been absolutely heart eyes emoji about the community online today. While many of you are marching (I wish I could be with you), lots of you are reading and talking and cheering each other on and I am here for it. Keep going, guys, you’re doing great! Half wild monstress, I see you. Give me your best stanza and I’ll pick a prize winner for this challenge at Hour 24 at midnight ET tonight. We’ve got another prize winner to announce, from Hour Twelve’s feminist challenge. And four more door prize winners too! Congrats, winners, and don’t forget to head to the Prizes page to pick your winnings! What’s your reading strategy for this weekend? Are you reading comics? Novellas? Short books? A series? Or one long doorstopper? I’m personally taking bites out of a few different books I’m in a middle of, plus an audiobook or two. Are you reading on a theme? From a set TBR? Or just whatever strikes your fancy? Need some inspiration? Check out this post I put up earlier this week. 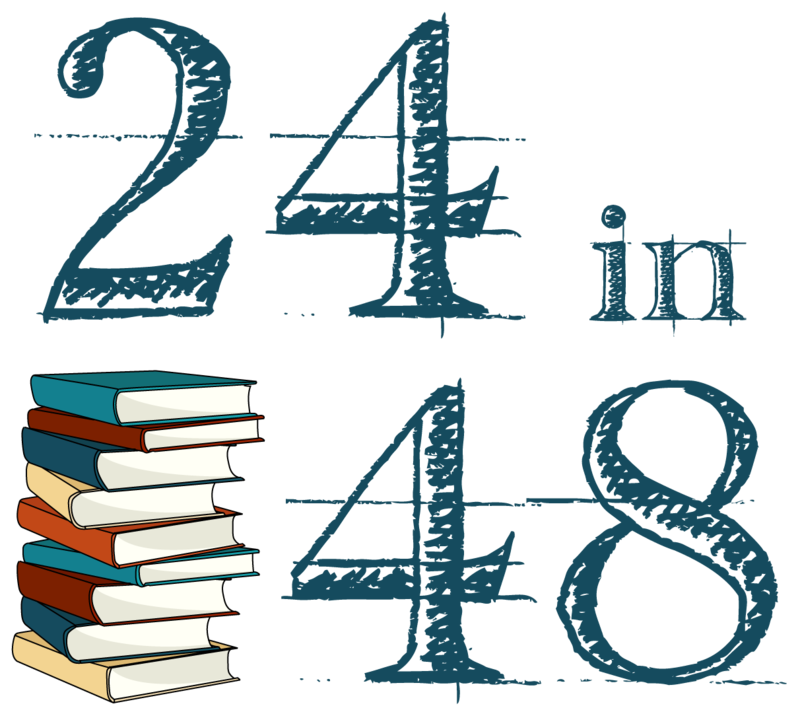 Have you checked in on social media with the hashtag #24in48? Don’t forget to cheer on your fellow readathoners this weekend. And don’t forget to check the previous check-in posts from Hours Three, Six, Nine, and Twelve to see if you won a prize. Thousands and thousand of women are marching in Washington, DC and across the country in local marches to protest our new administration. Women from all over are banding together to promote intersectional feminist ideals and demonstrate that together, we are stronger, and we’ve got no time for their ish. I wish I could be out there marching with all the badass ladies, but instead, I’ll be celebrating my favorite activists and feminists with some patriarchy-smashing reads. Your Hour Twelve challenge is this: in the comments, tell me either who you’d like to be marching with today or what feminist books you’re reading in solidarity? I personally would love to stand arm-in-arm with Gloria Steinem, Angela Davis, Michelle Obama, and Beyonce (anyone that stands in front of a giant “Feminist” sign is an activist in my book). And I’ve got We Should All Be Feminists by Chimamanda Ngozi Adichie, Here We Are by Kelly Jensen (you can win this one! ), the Mockingbird: Vol. 1 comic by Chelsea Cain, and Bad Feminist by Roxane Gay on my feminist TBR stack. I’ll pick a winner at Hour 18. And don’t forget you can still enter the Hour Zero: Intro Survey challenge until midnight ET tonight! For now, how about a winner for our Shelfie challenge from Hour Six? Excellent shelfie work, everyone. Not a bad looking reader among you. See you back here in three hours! Happy reading (and marching)!